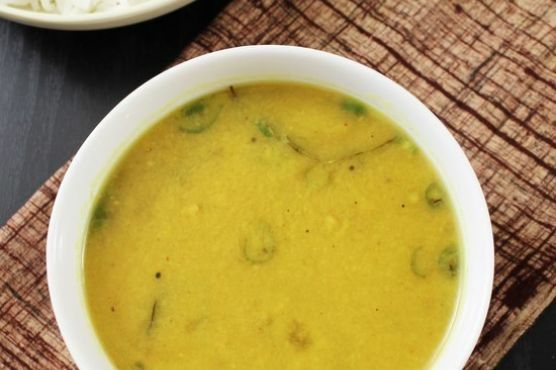 Wash the dal and soak in enough water for 30 minutes.Then discard the soaking water. Pressure cook the dal with 1 ½ cups of water and turmeric powder for 3-4 whistles on medium heat.Once pressure goes down then open the lid, add extra water is needed and mash the dal using hand blender. Put the dal on simmer. Heat the oil in tadka pan on another stove. Once hot add mustard seeds and let them pop.Then add curry leaves and green chilies. saute for 30-40 seconds and immediately mix in the mashed dal. Add remaining ingredients (tamarind paste, jaggery, salt, goda masala) to dal and stir well. Let it simmer for 10 minutes and it is ready to serve.